Customizable PIM on your desktop wallpaper ! it is a perfect Active Desktop Calendar Maker for you ! 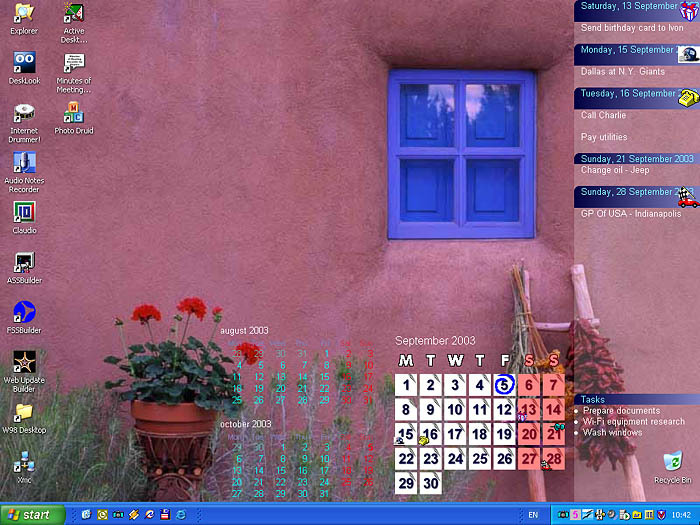 Active Desktop Calendar Fully customizable PIM that displays calendar data on your desktop wallpaper. It features interactive desktop interface, notes, tasks, alarms, data export/import and a screensaver. Create pleasant working atmosphere by changing icons, fonts, colors. With ADC, a thoughtfully designed calendar utility you were looking for all the time. Blends data with desktop wallpaper. Calendar, notes, tasks, alarms and many recurrence patterns for notes/alarms. Fully customizable (icons, fonts, colors). Screen saver with real time clock and Hide desktop calendar data if necessary. Three desktop view options for each note: normal, private, invisible. Each user profile has its own data set plus one common.